Action from Panthers v Redcar. 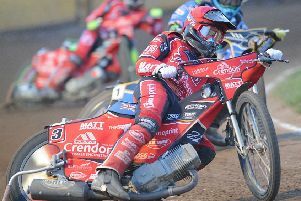 Peterborough Panthers have seen another SGB Championship meeting fall victim to the weather. The Panthers’ trip to Redcar tonight (June 8) has been postponed. It’s the fourth Peterborough fixture in recent weeks to be called off and they also saw a KO Cup clash at Scunthorpe abandoned last weekend. Peterborough are next in action on Sunday (June 11) when they entertain Berwick at the East of England Arena (5pm).